AMT Electronics are a Russian company specialising in effects pedals. Their origins can be traced back to 1982 in the then Soviet Union. Behind the Iron Curtain, founder Sergei Marichev, an avid musician and electronics engineer decided to try and build replicas of synthesisers and effects pedals that simply weren’t available in the Soviet Union. In 1987 Marichev formed a company which would become AMT Electronics, and the rest is history. AMT Electronics were not exactly a company on my radar was far as musical equipment go, but thanks to the folks at Jemsite and AMT Electronics, I am now very aware of them thanks to the SS-20 guitar preamp they arranged to have sent out to me for review. If the quality and tone of this little unit are anything to go by I am happy to wave their flag, and hope that other musicians get a chance to try out their gear and be amazed. When I first opened the packaging for the SS-20 I was amazed by how small it is. To put it in perspective it’s footprint is probably about the same size as a regular Electro-Harmonix pedal. It’s hard to believe that AMT Electronics have been able to cram a 2 channel tube preamp with solo boost in such a small space! Each channel has dedicated volume, bass, mid, and treble tone controls, and gain. The crunch channel has a 3 way switch for adjustments in the frequency response and gain, and the boost has it’s own gain control as well. AMT Electronics have also managed to fit an effects loop, and a cabinet simulator, which allows you to run the SS-20 direct to a PA or PC, etc and retain the same sort of tone you would have running through a guitar amp speaker. The unit itself is primarily black, with a chrome grill covering the 12AX7 valve. One thing I was kind of disappointed by was the knobs the SS-20 came with. The pictures online show the SS-20 having white knobs with blue stripes. I had read somewhere that they were apparently styled like the Soviet era nuclear capable missile the preamp is named after. My model only came with regular looking black knobs. It’s only a minor quibble though, what really matters is the TONE. The SS-20’s clean channel does a lovely job of achieving that chiming Fender amp sound, and sounds particularly beautiful with a guitar set to split coils. You can also push the gain and give your tone a little grit, much like a clean valve amp sounds when pushed hard. Switching over to the crunch channel you will discover hot-rodded Marshall stack tones. High output pickups will even push the SS-20 enough for great metal tones. Activating the boost switch will give you a fatter tone, and even more distortion. This is great for huge metal tones, and scorching leads. And the beautiful thing about the SS-20 is that no matter how brutal a distortion tone you set, there is barely a whisper of unwanted noise when playing. The tone controls on each channel are extremely versatile, and very user-friendly. I was able to dial in some great tones straight out of the box with minimal fuss. I was able to get beautiful, mid-strong rock and metal tones, and even great scooped extreme metal tones without even a hint of mud. Of course sludgy sounds were possible as well, but they are not my preference. The crunch channel’s 3 way switch is supposed to alter the frequency response, but I did not notice a big difference in sound. Maybe just slight amounts more of dirt, and slight changes to the frequency response. The SS-20's 12AX7 valve heart. The SS-20’s 12AX7 valve it certainly is not a gimmick. You can have the crunch channel maxed out, and roll back the volume knob on your guitar, and have your tone clean up considerably. The SS-20 also achieves that distinct tube sound that occurs when you crank a valve amp. It really is quite amazing that it captures all the overtones and harmonics you find when playing a valve amp. The SS-20 responds to your playing dynamics. Softer picking or finger picking will result in a cleaner tone on the crunch channel, and hitting the strings hard really smashes out heaps of of dirt. From what I could understand, AMT Electronics talk about the SS-20 operating just like a valve amp, where the valve is creating all the tone. The solid state electronics apparently only affect it once the boost on the crunch channel is dialed past 7. After testing the SS-20 out considerably I’d be inclined to believe them. It is brilliant that AMT Electronics have managed to capture authentic valve amp tone in such a small package, but there is more to the SS-20. The cabinet simulator works well for running straight to a PA or even a computer. AMT Electronics have really managed to simulate a great tone that sounds so much like a real amp running in to a great speaker cabinet. Now you can go to a gig and plug straight into the house PA, or easily achieve that cranked up valve amp tone for recording to PC without annoying the neighbours. I especially see this as a brilliant addition to home recording enthusiasts. 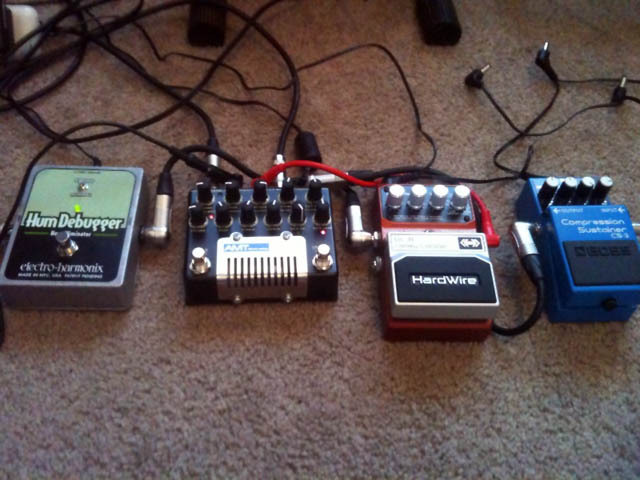 It’s a great little addition to your desktop, and having the ability to hook your pedal board to it is great. AMT Electronics have certainly put a lot of effort into using quality materials with their products. The SS-20 has a nice basic metal chassis that feels nice and solid. It’s not about to fall apart like a lot of plastic pedals feel. 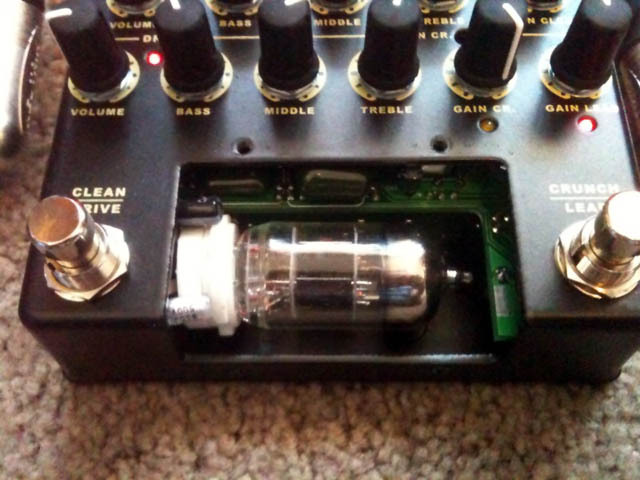 The 12AX7 valve is protected with a vented metal cover, and it also has vents on the bottom of the pedal. AMT Electronics also saw fit to provide rubber feet so that the pedal is lifted a little off the ground to help with ventilation. All of the dials on the SS-20 move smoothly and freely. I’d prefer a little more resistance in them, but that’s my personal preference, nothing against the quality of the pots installed. The only slight concern with the build of the pedal is the footswitches. At first they look like the same sort of units you find on MXR and Electro-Harmonix, etc but they aren’t actually the same. The switches showing aren’t actually the switch, they just push down and activate a micro-switch on the PCB. I’m sure that they should stand the test of time, but it would have been nicer to have the real deal switches. Overall the SS-20 is capable of any style of music. It is one extremely versatile unit. It sounds phenomenal through a valve amp, and even a solid state amp doesn’t hinder the valve tone this preamp generates. I believe that if you have a solid state amp that has the power to for a band situation, and an effects loop built in the SS-20 will give you authentic tube tone on a budget. A special thanks must go out to Alan at Jemsite, and AMT Electronics for sending me out the SS-20. It was provided as part of Jemsite’s review program. My original Jemsite review can be found here. One Response to "AMT Electronics SS-20 Guitar Preamp – review"